Browse our round tables and extensive range of extendable & round dining tables. Our round tables have a hard-wearing top and folding powder coated legs for maximum stability. These tables are perfect for banquet style dinners or workshop use as they allow full interaction around the table which you can’t always achieve with a trestle. Folding Tables and Chairs offer a generous range of round tables for sale throughout Australia, perfect for a huge number of uses. Our foldable legs and round tables are a wonderful addition to homes, schools, offices, cafes & restaurants, councils and more, as they allow for complete interaction around the table. Whether you are looking to host a pop up dinner party, conduct a meeting at work or organise an activity at a school, round tables allow everyone sitting at the table to see and talk to one another. Our quality round tables for sale feature hard wearing tops and powder coated legs that fold away under the table for easy storage. 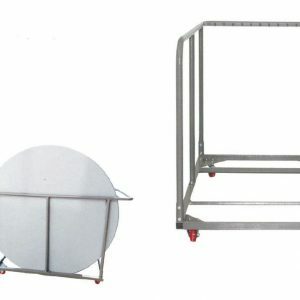 When you purchase your round tables from Folding Tables and Chairs, you can have complete confidence in the quality investment you are making, as these are the same products we use in our hire division for other customers. 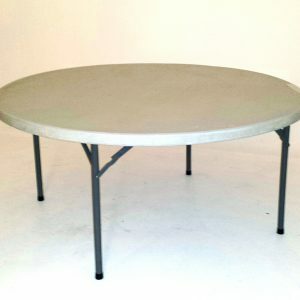 This durability means you will have a table that is ready to go to for events and last you into the future. For added peace of mind, we also offer a 2 year factory warranty on all our goods, excluding cases of self-inflicted damage. Get your very own round table today! By always having round tables on hand, you can make sure you are prepared for meetings, banquets and more. From conferences, award nights, community halls and dining areas, a round table is able to be used at any event. 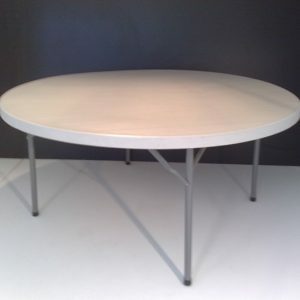 What’s more, you can also fold the legs up of your round table and roll it away to store. Great for BBQs and picnics. Café owners in particular will enjoy having our round tables handy, as they allow you to quickly provide an extra dining area indoor or outdoors for when you experience an influx of customers. As our round tables are easy to set up and put away, you’ll be able to save precious time and effort when organising your next event. 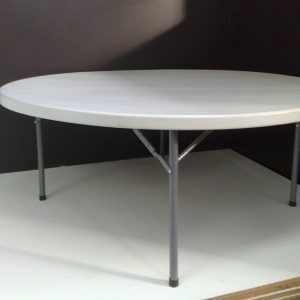 This ease of use can also save you potentially on labour costs if you are using your round table for business purposes. 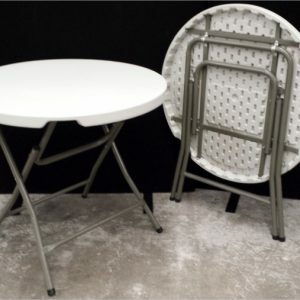 To buy a round table Melbourne locals should simply give Folding Tables and Chairs a call today to see our ever-increasing range of quality products!